AM Graphix - Specializing in Joomla website design and hosting. Is your website mobile ready and up to date? In today's busy world if clients are searching it isn't enough to just have a website you have to be found on search engines and your site must be attractive and easy to navigate on their device. If it isn't they will move on to the next site that is. My style on site builds is clean, modern and easy to navigate. A cluttered site is confusing to the eye and slower to navigate. Serve up the information quickly, attractively and easily read. These are of key importance to me and my site builds are reflective of that. 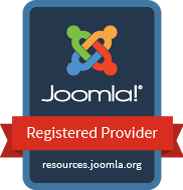 I build my sites using the Joomla! Content Management System using the most current stable version applicable. I host on Abivia Host who specialize in Joomla installations. This keeps my sites running fast and efficiently. All sites hosted with me also are HTTPS secured. I can maintain it for you while you are busy running your business. Backups and security patches MUST be done regularly and patches installed often within hours of release to keep your site safe. For less than the cost of a coffee a day I will take care of keeping your site up to date and backed up. You can still self update or I can save your precious time and manage updates as well and the technical part is taken care of. My Site Builder can't be found and I need to update my site. I hear this all too often and I can help. Let's get your site back on track then switch to a maintenance package customized to suit your requirements. Get your login and server access and let's do this. My site is old and I need to make it mobile friendly. I've got your back. Google scores websites lower in ranking if they were not mobile friendly. Let's migrate your content and give your site a fresh face. Visit What Customers Are Saying to read reviews from other clients I have partnered with to bring their site to life. AM Graphix was rated in the Top 1% Most Endorsed for Web Design in Canada by LinkedIn. I look forward to partnering with you to bring your site up to date and brand together that everyone who views any aspect of your promotion knows instantly it belongs to you.